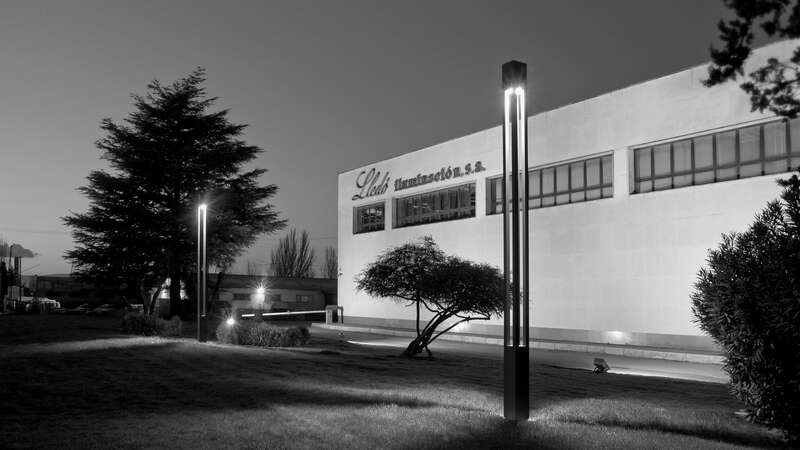 The LLEDÓ Group, founded in 1958, is the leading firm in the Iberian Peninsula devoted to the design, production and marketing of systems related to lighting fixtures, natural light, light control and integrated roofing. The Group operates directly in Spain, Portugal, France, U.K., Italy, Germany, Peru, and Mexico, and has sales operations in 20 other countries through partnering distributors. The Lledó Group has always been known for a high level of innovation in products and solutions, and for regularly providing to the market the most advanced technologies and ideas. It thus stands out as one of the companies that has more intensely contributed to the introduction of new trends. 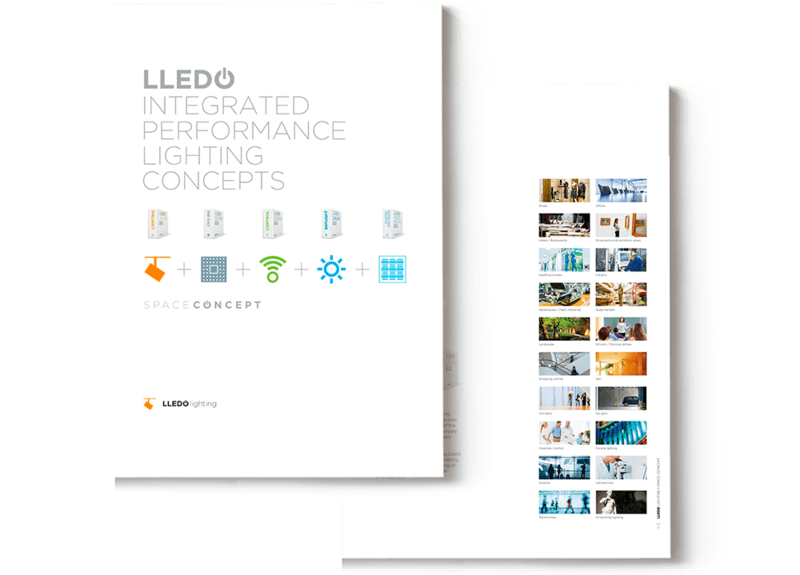 The LLEDÓ Group markets a range of over 17,000 different items in the field of lighting, lighting control, integrated roofing and natural light systems. In addition to the length and breadth of its products, the firm is a specialist in supplying custom goods according to customer needs. 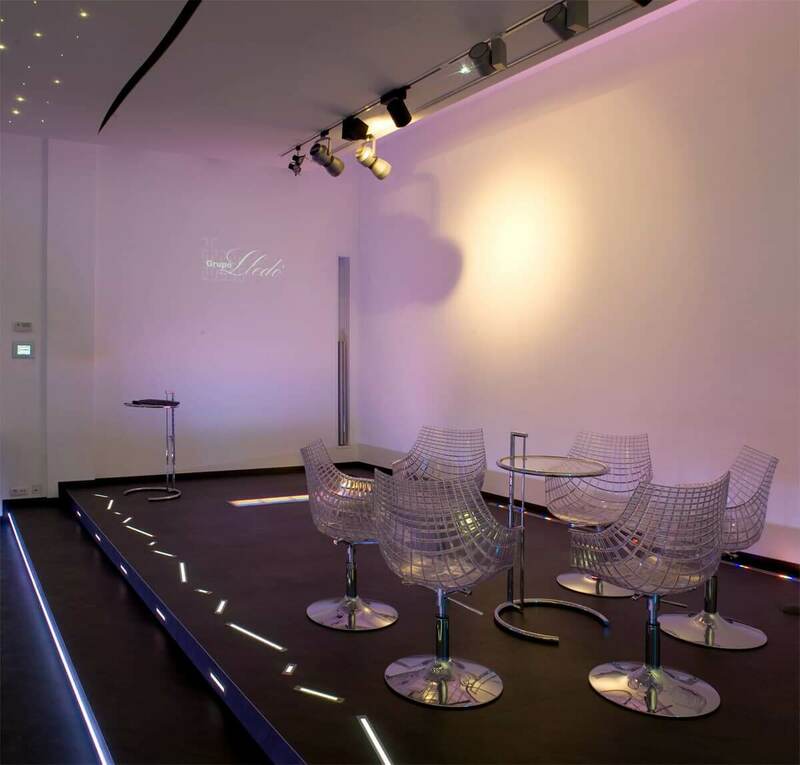 Apart from the marketing of products, Lledó is a leader in lighting projects and customised solutions using special products. In addition to products from the leading European manufacturers in the industry, marketed under sales agreements, exclusive license or in partnership, the Group has two manufacturing plants of its own: Odel-Lux, Staff Ibérica. The architect works with space, matter and form to give a building a purpose, utility and beauty. Our Group contributes to express architecture through our lighting systems that aid the use of space in the most diverse conditions, helping people and communities to share professional, cultural, commercial and entertainment settings, and shaping and enhancing the beauty of the architectural object. We specialize in the art of light. Light to communicate, admire, feel, observe and relax. The Lledó Group enters the new millennium with the same energy with which it has worked daily for 60 years. In the hands of our customers, our organization forms a structure that projects energy and creativity to architectural work, making forms, colours and textures visible. Our aim is simple – to become the technological partner of our clients and share with them the success of designing and installing lighting systems that meet the demands of architectural design and the desire for human welfare anywhere in the world. Opening of the first branch, located in Seville, Spain. Signing of the agreement with Staff for the distribution of its products. Lledó, SA, and Staff expand their cooperation. Opening of the plant by Staff Ibérica, SA. Opening of the office and warehouse headquarters. Consolidation of Odel-Lux, SA as the first manufacturer of luminaires in Spain that is ISO 9001 certified. Distribution agreements with the Austrian company ZG society and the Italian company OVA. Completion of the production process automation of Odel-Lux, SA. Staff Ibérica obtains the ISO 9001 certification (year 1994). Establishment of a distribution agreement with Chicago Metallic and Luxmate for Spain and Portugal. Distribution agreement with the British brand DW Windsor for Spain and Portugal. Lledó creates the new company Lledó Energía Solar. Creation of ODEL Decorative. Creation of a distribution agreement between Lledó Energía and Lledó Sunoptics for Europe. Launching of SIEE (Spanish acronym for Energy Efficient Lighting Systems). Construction of the Odel-Lux, SA plant. Creation of the research and development area of Lledó, SA. Signing of a distribution agreement with BEGA. First capital increase. Completion of the branch network in Spain. Establishment of the first international subsidiary of Lledó, SA: Lledó Portugal. Creation of the L&D product brand. Establishment of the Lledó France subsidiary. Strong growth of the international turnover of Lledó, SA. Odel-Lux products receive the Enec certification. Establishment of an agreement with Tridonic for the exclusive distribution of dimming systems. Opening of the first Light Application Centre in A Coruña and then in Madrid. Lledó opens its first own Lledó Factory. Lledó signs an agreement with the multinational Lutron for the distribution of control systems in Spain. Opening of the first Energy Efficiency Centre in Madrid. Lledó Group has not stopped growing since its foundation. Since its inception, our desire for development has driven us to seek new markets, in some cases, establishing alliances with leading international companies; all in order to consolidate as the leading group in all fields of lighting … and to master the light and its technology. Regarding the commercialization of our products, as well as those of the international companies with which we maintain commercial agreements, the group has the following corporate structure. Lledó Iluminación is a leader in lighting and custom solutions with special products, with direct operations in Spain, Portugal, France, England and Poland. It operates commercially in another 20 countries, with the largest product range in the market, comprising more than 17,000 references in both own design and manufacture and through agreements with international leaders like Limburg in interior lighting and Bega in exterior lighting. The Lledó Group undertakes integral lighting projects incorporating systems of control and emergency that allow it to meet the demands of projects with high standards of quality, differentiation and notoriety. Invested by the company in a 100%, it is dedicated to the manufacture of technical and industrial lighting and metal roofing. Odel-lux is a leader in the manufacture of products and systems focused on the completion of buildings. The versatility and high performance of our products, as well as the use of the most advanced technology in the entire range, make them tomorrow’s tools within the field of technical lighting. Therefore, Odel-lux is a company that looks firmly and securely into the future. Staff Lighting is responsible for the manufacture of the L & D decorative brand under conditions of exclusivity for Lledó lighting. Its purpose is to guarantee the exclusivity of its designs, for the sake of a greater enhancement of the architecture and a greater functionality of the interiors. Specialized in getting light where spot lighting is not enough, get your customers enjoy a dynamic light without sacrificing an attractive design in all its models. It presents a wide range for all types of indoor and outdoor lighting, as well as integrated roof systems. This strategic alliance strengthens our leadership position in the market. The Lledó Group is present in the energy sector through Lledó Energía, which aims to offer the market efficient lighting solutions aimed at reducing energy consumption and generating photovoltaic energy applied to buildings. Since 2007, it has been a member of the CCVE, the first national association of leading companies in the construction sector, to promote environmentally responsible buildings. GLASHÜTTE LIMBURG Specializes in interior luminaires made of glass. The luminaire collection comprises over 2000 models that are unique in the world – luminaires for all areas of interior architecture to solve design and lighting tasks inpublic and private areas. BEGA has developed and produced high-quality luminaires for almost all areas of architecture for more than six decades. During this time, products, their concept and trademarks have become a generic term for many luminaires in the entire industry. The light brick trademark has formed part of our programme for over 50 years. LUTRON Electronics founded in 1961 , it is headquartered in Coppersburg , Pennsylvania . Market leader in the field of lighting controls High quality from dimmers for housing to building management systems , the company offers more than 17,000 products and energy saving solutions to reduce lighting energy use and optimise system performance. The set of Social Responsibility actions developed by Lledó Grupo respond to a firm social commitment and the environment that we have voluntarily assumed in our business project so that it feels an active part in society contributing to economic and social progress in improving the quality of people. The commitment to the environment is a priority objective in the area of ​​Corporate Social Responsibility of Lledó Group. Energy is a fundamental part of the economic activity and social life of any society and, therefore, energy development must be developed in a planned and responsible manner. Compliance with international, national, regional and local environmental legislation: It is an attitude consistent with our culture to comply with all the legislation applicable to our business activity, especially those legislation designed to protect the environment. Collaboration with Public Administrations: Provide support to different public administrations in the search for solutions to environmental problems. Incorporation of criteria of management, direction and production committed to the environment: The commitment to adopt the necessary measures to avoid any risk of environmental contamination or to minimize its effects in the event of any contingency, in accordance with the provisions of international standards and our country. The implementation of systems of good environmental practices in the development of our activity, which means ensuring the environmental respect of our suppliers and because our employees develop behaviors consistent with these commitments. The promotion of information, education and environmental training among our public and society in general, collaborating with the agencies involved in this task, whether public or private, within the scope of our activity. Odel-Lux, productive unit of Lledó Grupo, aware of its commitment to contribute to sustainability in the protection of the environment and the reduction of consumption of resources, adopts since 2016/2017 a process of change and improvement to achieve greater energy efficiency in their activities. For this purpose, it has an Integrated Energy Management System, which is governed by the specifications of the UNE-ISO 50001: 2011 standard, as a tool for optimizing the use and energy consumption in a continuous manner, allowing the optimization of economic costs and greenhouse gas emissions. The scope of the integrated system includes all areas of the organization. Promotes efficient use and consumption of energy among workers in all operation and maintenance activities; evaluates resources, new equipment, machinery and products obtained from its suppliers based on the organization’s energy performance; performs studies, analysis and monitoring of the uses and energy consumption of its facilities to later invest in its improvement; and it includes in the procedures and policies of the company approved by the management its commitment with the realization of these activities. Download the quality management documentation of the Lledó Group. The symbol of the crossed-out bin that is shown on the appliance indicates that the product, at the end of its useful life and having to be treated separately from domestic waste, must be taken to a collection and recycling center for electrical and electronic equipment. or must be delivered to the reseller when new equivalent equipment is purchased. The user is responsible for the delivery at the end of the equipment’s life to the appropriate collection structures. The appropriate differentiated collection so that the equipment in disuse is recycled, treated and disposed of in an environmentally compatible manner helps to avoid possible negative effects on the environment, on health and favors the recycling of the materials with which the product is composed. product. For more detailed information on the collection systems available, contact the local waste disposal service, or the store where you purchased the equipment. As a producer of industrial batteries under the Waste Batteries and Accumulators Regulations 2009, we Lledo Iluminacion S.A. produce luminaires containing Nickel-Metal Hydride cells (NiMH) batteries. We are obliged to take back free of charge, waste industrial batteries supplied to an end user for treatment and recycling. We are required to do this in any calendar year we place new industrial batteries on the market. If any of our customers or in certain cases other end users, require us to take back Industrial batteries, they should contact us at Mail: uksales@lledouk.com Phone: 07823771501 We will agree the necessary arrangements for the return, proper treatment and recycling of the waste industrial batteries.